Audio file player and converter and more. Is there a better alternative to Snapper? Is Snapper really the best app in Audio category? Will Snapper work good on macOS 10.13.4? What's Snapper? When you select an audio file in the Mac Finder, Snapper immediately appears right beneath the current window, showing you the wave form. Play: Hit the space bar or double-click in the wave form to play. Or use auto-play to start playing the moment you select the file. Vari-speed is available too. upload it to your Pro Tools cursor. 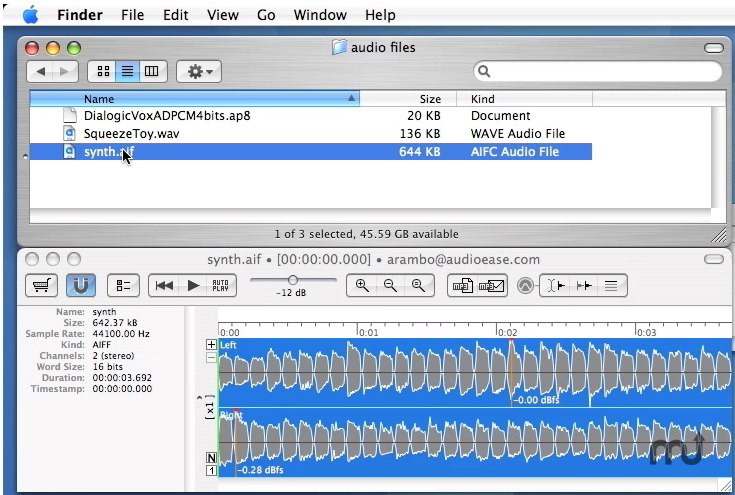 turn the selection into an mp3 file. Odd-sized Wave files were rejected. Snapper needs a rating. Be the first to rate this app and get the discussion started! Which formats can it handle? All of them. Snapper opens over 50 sound file formats. That includes compressed files, split stereo, 192 kHz, 5.1 surround files, red book audio, CDs and movies containing audio. It shows loops, markers, timestamps, regions, BWF annotations, even album covers. You name it, Snapper can handle it!